Metal roofs are gaining in popularity because they have many benefits. More and more consumers are choosing metal roofing because of its durability, low maintenance, energy efficiency and environmental benefits. Metal roofs are also ideal when considering solar on your roof top. Material used in metal roofing is energy efficient. Because metal reflects heat, a metal roof blocks the transfer of heat into an attic, reducing attic temperatures by up to 34% and can lower heating and air conditioning bills. Also, a light-colored metal roof deflects UV radiation, which keeps a home warmer in the winter, and cooler in the summer. 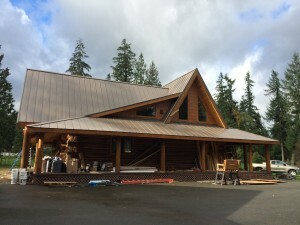 24-Gauge Standing Seam Metal Roof. Series 6000 by Nu-Ray Metals. Shown in Weathered Copper. Metal roofs are also generally made from up to 65% recyclable material. Also, metal roofs are 100% recyclable if they are ever replaced. Unlike other roofing materials like asphalt, a metal roof will not decompose and can battle and withstand most weather related elements. Metal roofing outlasts several other roofing types specifically because it can withstand harsh weather. For example, wood shingles and tile have regularly experienced weather related issues like cracking, curling and drying out, causing replacement before 20 years. Other roofing materials like concrete tile roofs have problems with freeze and thaw cycles, especially in northern climates. Metal outlasts most other roofing options, and maintains its good looks. Metal roofing styles have come a long way since they first came on the market and can adapt to most any climate or architectural style or neighborhood. Metal roofs offer several valuable features to consider for a homeowner that is looking to replace a roof. A professional metal roofing installer will provide sound advice for anyone considering roofing options, as a metal roof. PRP installs standing seam metal roof products by Nu-Ray and Custom Bilt Metals.